Craftsman Style Belmont Plan in the new Phase 2 of Belmont S/D in Arlington. 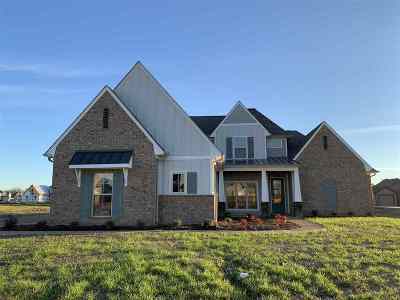 4BR 3 Full Baths with Completed Bonus Rm upstairs. Very Open Floor Plan with Hardwood Flooring, Painted Cabinets, Stainless Steel Appliances with Double Oven Gas Range, Covered Patio, Free Standing Tubs with Separate Tiled Showers in Master Bath, Granite in Kitchen and all baths and much more! Arlington Award Winning School District. Near I-40 and 385. Photos are of same plan but not exact house.